MedCubes provides the needed functionality to ensure the best quality of patient treatment. This means that the solution includes various elements including clinical practice, nursing, workflow processes and administration. Due to the needs of the different user groups these so called MedCubes-Apps can be combined to a unique user interface. MedCubes provides the necessary information so that the users can focus on the patient´s care. 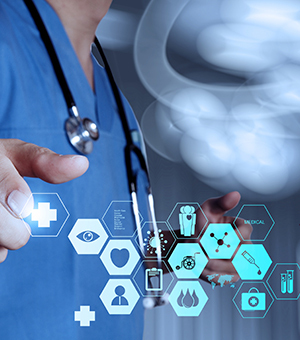 MedCubes automates processes within the different facilities depending on predefined workflows in combination with the situation of the patient. Running MedCubes in a private or public cloud reduces the costs of infrastructure like servers as well as operational expenses for maintenance. MedCubes will maximize resources with minimum costs for both implementation and maintenance. Because of the central installation the maintenance becomes quite easier for the IT staff. Besides running the application in one or more hospitals there will be new markets, e.g. in home care. Therefore MedCubes allows external users as well as patients to communicate with the solution via encrypted internet or intranet connection. Based on state of the art technology, MedCubes supports the use of various hardware devices. These may be desktop PCs in hospitals or home nursing bases – laptops, tablets or smart phones for mobile users. The way to realize this vision is by implementing the solution in a private or public cloud environment using the latest available technology. Under certain circumstances internet connections may not be available. Therefore MedCubes contains a special technology for offline operation. This means that data entered for example at the patient’s home without internet connectivity will be stored locally on the mobile device. As soon as the connection is available again the data will be synchronized. MedCubes is able to manage various hospitals or other facilities in one multi-tenant environment or database. This eases the methodology of data exchange between different locations. By using a private or public cloud the data is accessible in a secure way from any point within the network depending on the permissions granted to the different users. Integration also means that other service providers can be integrated into the network like separated family doctors and home nursing facilities as well as the patient himself to achieve continuum of care. To simplify the way for connecting different other applications to MedCubes we provide assorted web services to read or write data. MedCubes also contains an HL7 interface based on the standards defined by IHE. MedCubes will be launched in various different areas. The range starts with hospitals, mobile services up to the patient themselves. But even in a hospital there are varying scenarios depending on the different user groups like management, doctors, nurses, technical staff or administration. MedCubes is based on a set of different modules called MedCubes-Apps. By using smart assistants these MedCubes-Apps can be freely combined to build a complete flexible desktop matching the user’s needs. To expand the available apps without development MedCubes contains DynamicApps. Based on a free definable data dictionary the customer or consultant can define forms integrated into the solution. These forms contain access to other static database fields, to calculation and to the workflow engine. Without the need of IT knowledge you can design your own MedCubes-Apps. On the other hand CommunityApps are the way to expand the functionality by developing their own apps using Microsoft .NET technology. MedCubes opens the whole framework, development model and programming interfaces to certified partners and customers. Alongside our development company AHCS AG, certified partners and independent software vendors will develop their own additional apps and modules. By providing a global internet market place, these certified apps can be traded worldwide by our partners.